If you own a business in Hallandale Beach, you know that Broward County just keeps growing. From the bustling financial district, multiple restaurants and other commercial and small businesses, Hallandale Beach is bustling. More business and more people can also mean more risks. A security system is probably not something you want to think about. You hate to think that everything you’ve worked so hard for could be the target of a fire, crime or catastrophic event, but you know it’s possible. If your commercial, retail or small business location were subjected to a disaster, how long would it take you to recover? Businesses from the smallest stores and shops to the largest warehouse and retail chains are vulnerable to any number of disasters. You’ve worked hard to make your business a success. Don’t risk leaving it unprotected. Your business needs to be safe for everyone–employees, customers and visitors. They count on you to ensure that your facility is safe. Your security system can not only keep everyone safe, it can also minimize your risk from OSHA violations, frivolous lawsuits, medical and accident claim issues. You’ll have a better handle on quality control and safety. Whether your facility large or small, Hi-Tech Security can design and create a security system that fits your needs, specific objectives, and any outside regulations. We take into consideration your day-to-day operations as well as your budget. From floor and checkout coverage, extra security in dark, hidden corner” or an entire indoor and outdoor wireless system, your business can be protected at the touch of a button. Your system can be easily accessed and controlled from your smartphone or tablet. Don’t take chances–protect your business from fraud, theft, inefficiency, vandalism, “accident” claims and other expensive mishaps. A small business can be particularly vulnerable to both natural and man-made disasters. Whether you need just a security camera or a complete system, Hi-Tech Security can help protect your business. We can install safeguards like cameras, access control and burglary monitoring, as well as give you smartphone-enabled remote access and control. You’ll be able to check in on your business from across the street or across town. What security camera do I need? And much more. We’ll work with you to put together a security system that works the way you need it to. Hi-Tech security has been installing security systems into businesses all over the Tri-County area for over 14 years. 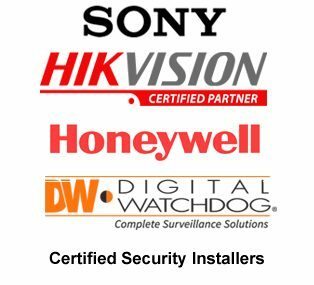 State licensed and insured, our technicians are Certified Security Installers of Sony, Hikvision, Honeywell and Digital Watchdog CCTV Security Products. We follow all NEC (National Electrical Code) Industry Standards. If your business is in Broward, Miami-Dade and Palm Beach, contact our Oakland Park installers at (954) 394-2292 to get your free installation quote today.